Wheeled fire extinguishers are larger extinguishers suited for use in combating fires in industrial and commercial settings such as chemical plants, ship docs, off shore rigs, aircraft ramps, construction sites, large laboratories, specific product manufacturing settings, docking and loading areas, processing plants, etc. However, while certainly larger and heavier than handheld extinguishers, they are designed to be operated by a single person and therefore are engineered with rugged frames, a broad and sturdy base of support, functionally designed semi pneumatic tires or larger diameter steel wheels, and balanced weight distribution enabling them to be transported rapidly and with control by a single person; down corridors, around corners and over rough terrain. These heavy-duty wheeled fire extinguishers come in ABC, Standard, and Purple K Dry Chemical models and Carbon Dioxide and Halotron units for use when sensitive electrical equipment may be involved. Wheeled units are available for Class A, Class B, Class C, and Class K fires. Nearly all qualified wheeled fire extinguishers are rechargeable and meet relevant regulatory requirements (e.g., UL, ULC, TC, DOT and USCG) and are approved or listed by the National Fire Protection Association, Underwriters Laboratories (U.S. and Canada), the Occupational Safety and Health Administration and the United States Coast Guard. Wheeled fire extinguishers come in fire extinguishing agent unit sizes ranging from 50 lb to 350 lb, the larger the unit poundage the greater the UL Rating fire extinguishing capacity. These units typically come with a larger hose diameter and length and associated tires or wheels designed to best handle the greater weight options. The area where a fire might occur in your facility and the square footage of fire that might need to be extinguished. The fire extinguisher’s UL Rating provides the square footage the extinguisher will be able to cover in extinguishing the fire. The fire extinguisher agent discharge time and range that would enable you to reach the farthest point of where the fire might extend in your facility. The diameter and foot length of extinguisher hose. The class (A, B, C, D, K) of fire, or fires, most likely to occur in different locations within your facility or facilities. If sensitive electrical equipment is contained in specific rooms or areas requiring an agent that will not leave a residue or cause corrosive damage. 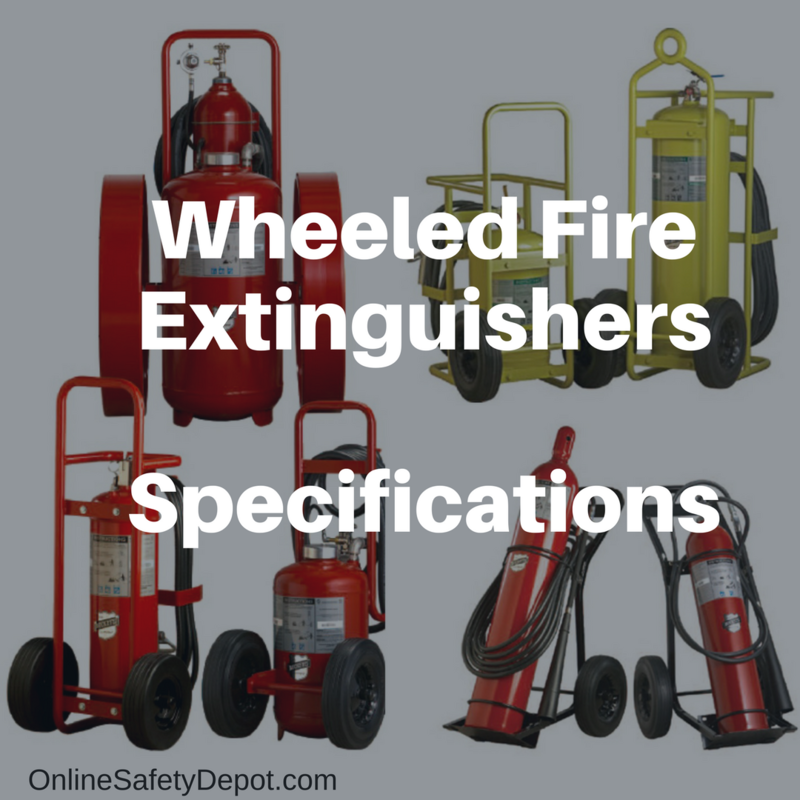 Below are the distinguishing features of each of the size/pound wheeled fire extinguishers currently offered to help assist you in your decision-making process. Individual model specifications are listed for each product on its individual product page including the tire or wheel specifications unique to the various models. OnlineSafetyDepot offers wheeled fire extinguisher brands Buckeye and Badger who have more than a combined 140 years of service in the fire safety industry as recognized and trusted leaders in the development and manufacture of dependable fire protection products.